Pastry cream, also known as crème patissière, is used in all kinds of desserts, as a filling for pastries like cream puffs (profiteroles), éclairs, fruit tarts, as a pie filling, or in between layers of a cake. This pastry cream recipe includes butter, which not all recipes do, but it makes the pastry cream a little bit richer. Fun fact: pastry cream is really just pudding made with double the amount of cornstarch! Heat the milk in a heavy-bottomed saucepan over low heat just until it starts to steam. Separately, whisk together the egg yolks, sugar, and cornstarch in a large bowl. You're going to want to whisk really hard until the consistency is thick and creamy. Once the milk has just begun to steam, slowly pour about half of the milk into the egg mixture in a thin stream, while mixing vigorously. Leave the rest of the milk in the pan. Next, add the thickened egg mixture back into the pan with the rest of the milk. Again, whisk vigorously, for 2 to 3 minutes, while continuing to heat the mixture gently over medium heat, until the pastry cream is quite thick. But don't let it burn. 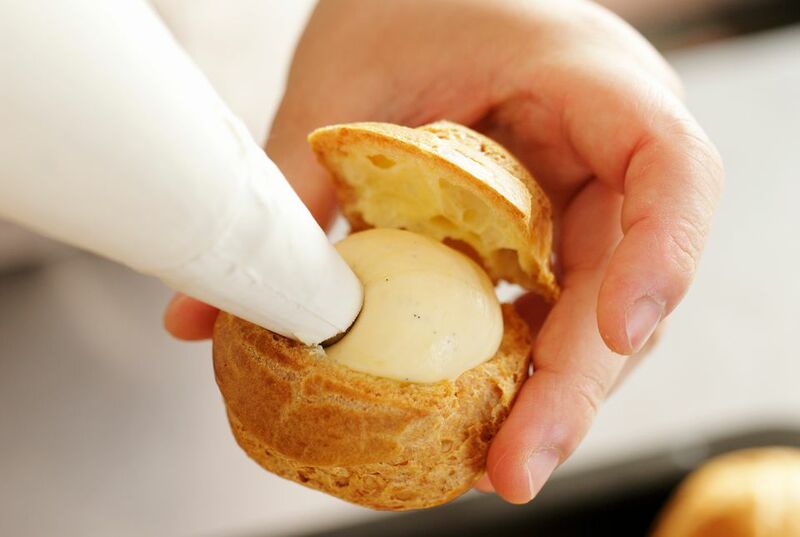 To cool, transfer the pastry cream to a bowl, and then set that bowl inside a larger bowl filled with ice water. Cool like this for 30 minutes. Then refrigerate the pastry cream until it's fully chilled. About four hours in the fridge is best, but it will keep in the fridge for 2 to 3 days. Just like pudding, pastry cream will develop a skin on top. To prevent this, you can cover it with plastic with the plastic wrap pressed all the way down onto the surface of the pastry cream, so that no air gets in.